Ben Crawford – Courtesy of Nicholas Shotwell. Used with permission. If ever there were a performer who encapsulates the qualities of a Broadway leading man, it is Ben Crawford. 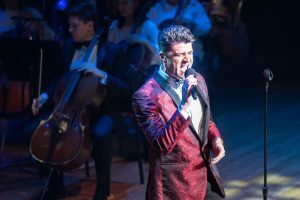 A singer-actor, he appeared Friday in “Broadway & Beyond” with the Indianapolis Symphony Orchestra, led by conductor Jack Everly in a Printing Partners Pops concert at the Hilbert Circle Theatre. When it comes to vocal and dramatic talent, looks, showmanship and a likable stage persona, Crawford is the total package. Crawford, who performed previously with the ISO in “Yuletide Celebration” and other concerts, has appeared in such Broadway shows as “Charlie and the Chocolate Factory,” “Shrek The Musical,” “Big Fish,” and “On the Twentieth Century.” Currently, Crawford is playing the Phantom in “Phantom of the Opera,” celebrating its 30th anniversary at The Majestic Theatre. Crawford also performs regularly with symphonies throughout North America, thanks to Everly, whom he acknowledges as a mentor. As far as programming goes, Crawford, presumably in collaboration with Everly and executive producer Ty Johnson, could not have chosen a better selection of songs to illustrate his vocal prowess, range and most notably, his extraordinary versatility. Plus, he chose songs that really showed off his powerful baritone voice, blessed with a tone unique for its warmth and richness. My guest, who loves opera, agreed when I theorized that Crawford sounded like he might have classical voice training. Also contributing to the high entertainment caliber of Crawford’s concert was his playful banter with the audience. 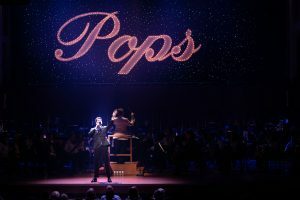 His comments, reflecting humility and gratitude for his successful career, connected him to the largely baby-boomer audience that responded enthusiastically throughout his performance. For anybody who loves Broadway show tunes as much as I do, the program was indeed an embarrassment of riches that showcased Crawford’s superb interpretive skills in songs that included Irving Berlin’s “Let’s Face the Music and Dance,” “If I Can’t Love Her” from “Beauty and The Beast,” and “Soliloquy” from “Carousel.” Crawford even demonstrated finesse in singing R&B in his styling of Billy Joel’s “New York State of Mind”— all in Act 1. Like the classic Broadway leading men who came before him and are his contemporaries, Crawford exhibited not only vocal power and larger-than-life stage personality, but also a storytelling ability that was compelling. Combined with what he described as the “amazing wall of sound behind me,” this concert will long be remembered for the performances of its gifted headliner and the incomparable ISO and also for the transportive quality of its wonderfully curated content. For tickets and information about the remainder of the Indianapolis Symphony Orchestra 2019-2020 season, call (317) 639-4300 or visit indianapolissymphony.org.